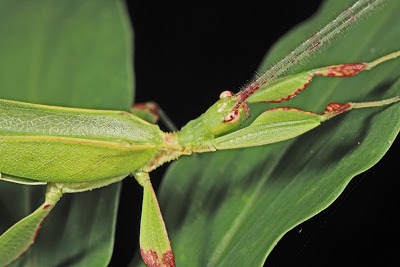 Monteith's Leaf Insect, Phyllium monteithi Brock and Hasenpusch, has been noted in this blog on several occasions. Females are very rarely found. They seem to be restricted to the rainforest canopy and are reluctant to fly, if they can. Only a single female has been discovered in several years of searching by many local enthusiasts. Males come to lights and one was found in mid-May, rather late in the season. This one seemed especially photogenic and lent itself to some close-up photography. The front femora are flattened and irregularly armed on the anterior margin. The internal base of the femur is "excavated" to accommodate the head and protruding eyes. The front tibiae are less produced and the internal margin is not armed. The head is notably flattened and bears the ocelli. The antennae are fuzzy throughout but the tips are different. The "flagellum" of the antenna is composed of elongate segments covered with fine setae. But the tips bear much shorter segments that are bare. What could be the function of this? Scanning electron micrographs might reveal different sorts of chemical and tactile receptors in each region of the antenna. 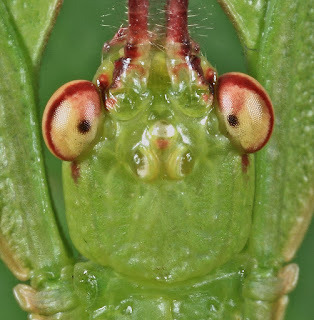 The top of the head bears the base of each antenna, the compound eyes and three ocelli. 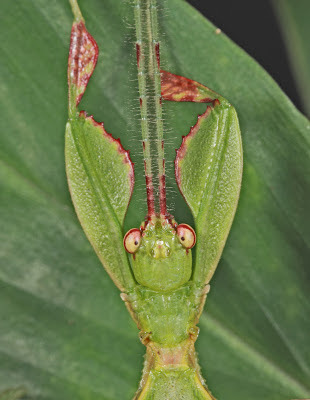 The ocelli are found in most insects are said to vary in function from one group to another. Flying insects like this one have larger ocelli and they are usually positioned as a triangle atop the head. 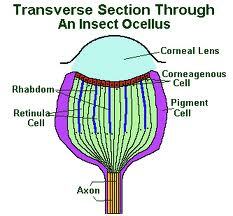 This schematic representation of an ocellus illustrates that it bears a lens element and a number of photoreceptors. But it is a different photo-receiver from that of the compound eyes. The latter are much more complicated. These ocelli may serve as a light metering system for the insect. They cannot receive form. They may serve in stabilising the insect during flight. Some suggest they may have a role in receiving polarised light. 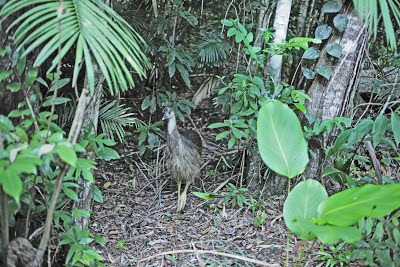 I haven't had much to say about the cassowaries this year. But they have been around since the first noted sighting in late November, 2012. It's remarkable that they and their parents have survived to this point. A procession of heavy vehicles associated with logging on Black Mountain Road meant that every time they crossed, they had to take a risk of being hit. Mr Cassowary surely is road savvy. We hear he has been around for some 40 years and during this period he has brought from 1-3 chicks to adulthood nearly every year. This year we have three and today they appeared without Pops for the first time. He showed up later in the afternoon. We suspect that he is not far off when the young are driven off--just to be sure they are not harmed. The chicks are very wary and appear bewildered. They scrap a bit amongst themselves. They will not understand why their protective father has suddenly become the "enemy". It's a big world out there. 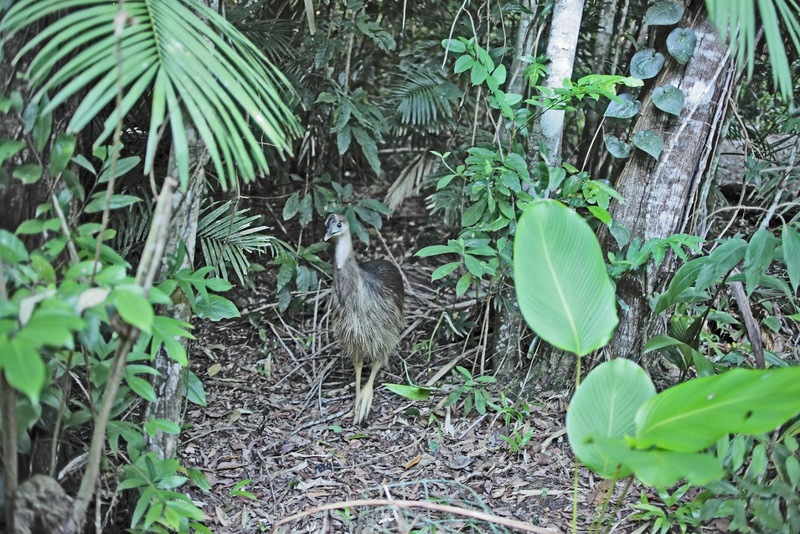 The lessons provided by the father will serve the young cassowaries well if they have been good students. There are many skills that have been learned but the hazards are many--wild dogs, pigs, cars, falling trees, barbed wire and potential shortage of food. These young will be driven off the resident pair's territory and will have to establish a territory of their own. It would really be interesting to know where each ends up. 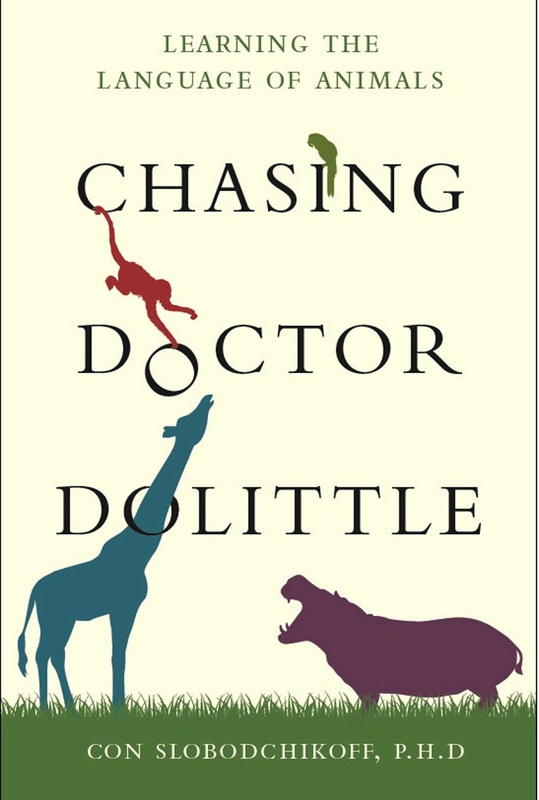 Lifetime friend Prof Con Slobodchikoff has produced another book. It took some 6 weeks to reach Kuranda via Ebay and I thought that was probably a good thing, meaning that the book was in high demand and perhaps, had to undergo a second printing. Let's hope so. Con has spent his academic life studying animal behaviour. He tended to specialise in the behaviour of the several species of Prairie Dogs. These are communal rodents that live in the grassland communities of North America. They were once much more common than they are now and used to co-habit with the North American Bison. We all know that animals communicate with one another by various means--vocal, chemical or visual. But what about a "language"? Con develops this theme in a most interesting read. You may be surprised at his conclusions. I strongly recommend this book. It could change your outlook towards the other species that occupy our planet.